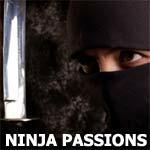 A Ninja was someone whose very existence expressed the spirit of Budo. He would protect himself with techniques not of assassination but rather of sensation and an acute awareness of his natural surroundings. He would avoid unnecessary conflict, and even if armed with a blade, would find a way to win without staining it. These are the true techniques of Ninjutsu, and the art in which Ninja persistently trained. Dr. Masaaki Hatsumi, Ph. D, is the most famous Ninja grandmaster in the world today. In this book, he explains the essence, truth, and wisdom of Ninjutsu, an art of a thousand forms and innumerable variations. Through perceptive observations and many detailed pictures, the author reveals the hidden reality behind this mysterious and fascinating martial art. The Way of the Ninja will help widen readers' perceptions and deepen their understanding of two essential principles. One is that Ninjutsu is the very backbone of the martial arts; the other, that Ninjutsu reveals their true spiritual significance.